While some have championed the Liberal government’s $83.7 million tax cut to the Australian Broadcasting Corporation (ABC) in the 2018 Budget, the people of Australia are not as supportive. The cuts, which were announced as part of the budget last week and will be fleshed out through an “indexing freeze” to the ABC, and have already garnered national attention from senators and the media. Now, The Australia Institute has given everyday Australians a voice to share their opinion of the cuts. The poll, called ‘Hands off our ABC’, found 70 per cent of people wanted a strong ABC and 60 per cent agreed the ABC needed a “boost to long-term funding”. 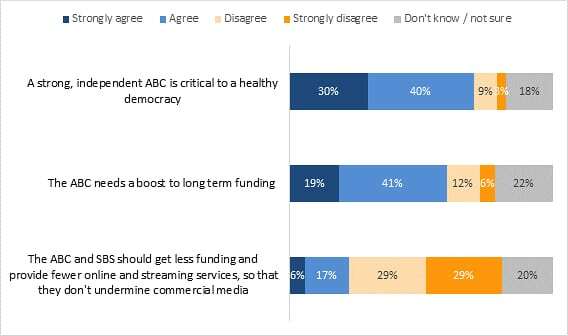 Responding to the question, “The ABC and SBS should get less funding and provide fewer online and streaming services, so that they don’t undermine commercial media,” 58 per cent of participants disagreed. The ABC has found itself in a world of strife since the Budget cuts were announced. ABC MD Michelle Guthrie vowed she would fight the cuts. Guthrie told ABC staff the broadcaster’s execs would “oppose the decision and seek every opportunity to reverse the cuts in the coming months before they take effect”. The Media, Entertainment & Arts Alliance (MEAA) has also made a statement on the cuts, labelling them “dangerous and irresponsible”.